, this was a banner year for the ads on the YouTube AdBlitz channel. With nearly 40 percent more total votes cast this year than last, this year’s fan favorite received 60 percent more votes than last year’s top pick. And which brand landed on top of the list this year? Congrats to Nissan, voted by fans to be their Favorite Super Bowl Commercial of 2015. Nissan tugged your heartstrings showcasing their “With Dad” commercial, and garnered the most votes against some very stiff competition to become the YouTube AdBlitz 2015 Champion! Last year’s winner, Budweiser, had another strong showing with their “Lost Dog” commercial coming in fourth. Visit the AdBlitz channel to watch all of this year’s big game ads. The last great battle for big game ad supremacy was waged last week as votes for your favorite ads came flooding in. Not only was this the biggest year ever for big game ads on YouTube, this was a banner year for the ads on the YouTube AdBlitz channel. We found that viewership is growing faster than before - people have watched more big game ads and teasers in the first six weeks of 2015 than all 52 weeks of 2014. 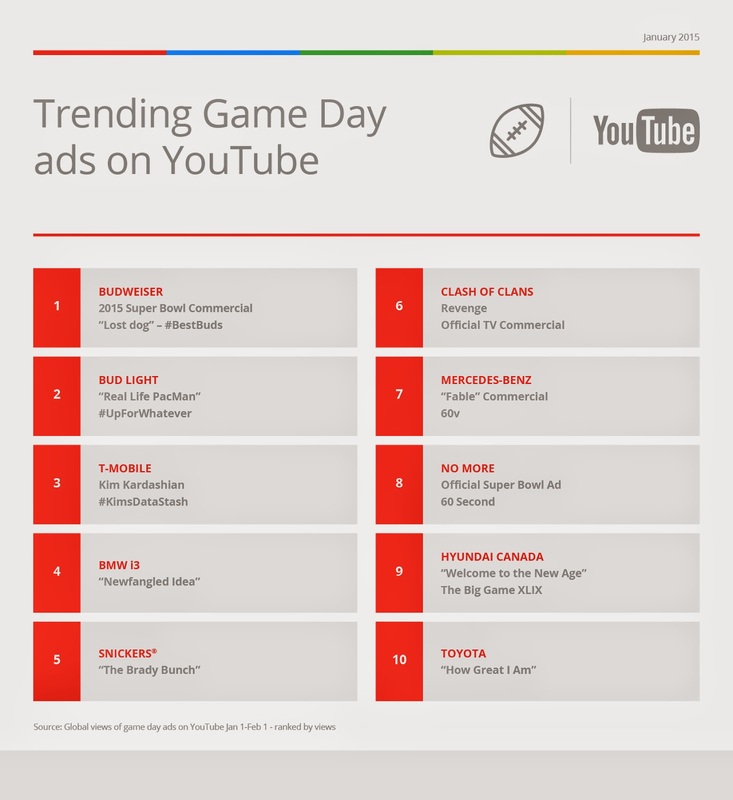 More than 7M hours of big game ads and teasers have been watched on YouTube, up from 6.3M hours for all of 2014. YouTube has evolved to become the place brands go to engage with their audience before, during, and after the big game. That’s why revenue from our AdBlitz program set a new record this year, with brands investing more on YouTube around the big game than years past. And, we’ve hit a new record in watchtime across YouTube—the growth rate at which people are watching YouTube has nearly doubled in the last year, leading to the fastest growth we've seen in years.